After the September 11, 2001 terrorist attacks on the United States, President George W. Bush assumed powers to respond to these threats in ways that would have proved quite unpopular on September 10. For example, the government employed extraordinary rendition and held captured suspects without criminal charges and without access to counsel for years at a time. The nation’s civil libertarians erupted in protest, contending that the government was, in responding to the threat, employing un-American means that were typical of petty dictatorships, not the world’s greatest free republic. But were these tactics really atypical of our government? In the closing presentation of the 2011 AJEI Appellate Summit in Washington D.C. on November 13, Harvard Law Professor Jack Goldsmith offered an insider’s perspective and a remarkable historical context for the nation’s military and law enforcement response to the terrorist attacks. His comments previewed his upcoming book, Power and Constraint: The Accountable Presidency After 9/11, which will be published in March 2012. Goldsmith is a former general counsel for the Department of Defense, and served as legal counsel to President Bush in 2003 and 2004. In the latter role, he participated in Executive Branch discussions of various techniques to deal with captured enemy combatants, and reportedly did what he could to rein in others’ efforts to expand the President’s powers, particularly with regard to interrogation techniques. Goldsmith’s presentation, “The Constitution in Wartime – Historical Perspective,” focused on the historical backdrop of the Bush Administration’s decision-making. Goldsmith noted that the curtailment of civil rights is nothing new in America. Abraham Lincoln famously suspended the right of habeas corpus during the Civil War (something that Bush never did); Woodrow Wilson cracked down on dissent during World War I with sedition prosecutions; and Franklin Roosevelt convened truly secret military commissions to try – with remarkable speed and efficiency – captured enemy combatants in World War II. Quoting Roosevelt’s Attorney General Francis Biddle (who went on to become a judge at the International Military Tribunal at Nuremberg), Goldsmith observed that through and including the Second World War, “the Constitution has never greatly bothered any wartime president.” He also cited historian Arthur Schlesinger, Jr., from 1973: “The Supreme Court has never tried to interfere with wars in progress.” The American public historically has been largely tolerant of the government’s efforts to protect a nation at war, even if that resulted in the loss of civil liberties during these times. And yet, Goldsmith noted, by the time of the Bush Administration, Congress, the nation, and especially the courts were willing to push back. What changed? There are several answers to that question, but among them, the most important may be the evolution of society and the law between 1942 – the year of Japanese-American internments – and 2001. Over that span, no war (after World War II) had implicated civil liberties, in large part because places like Korea, Vietnam, and Grenada were far from our shores and, as Goldsmith noted, the direct threat was thus widely perceived as more remote. In contrast, the nation had experienced the explosion of personal freedom of the 1960s and the distrust of the government engendered by the Watergate scandal. Americans were more willing to ask questions before concluding that the government was doing the right thing. Others in this string of decisions – especially Hamdan, which Goldsmith noted “brought the CIA’s interrogation program to a halt” – may have received more ink, but Goldsmith concluded that Boumediene was the most important in reining in the limits of presidential power. Presidents Bush and Obama have released many prisoners – 500 as of 2010 – because they felt that they could not meet the requirements for detaining them in the wake of the Boumediene decision. The ruling, Goldsmith quotes one observer as saying with perhaps a dollop of exaggeration, has led to an unprecedented situation where “the courts supervise the battlefield conduct of the United States military.” And while Boumediene does not apply in Afghanistan (since the United States does not exercise actual or virtual sovereignty there), Goldsmith explained that the US military is applying its requirements there anyway, making US troops both soldiers and evidence-gatherers with an eye toward eventual litigation over the lawfulness of detentions. Goldsmith also explored how entities aside from the courts have furthered the checks on presidential prerogative. The press has been ever more vigilant in seeking classified documents under the Freedom of Information Act; Congress, once a “lap dog” to the President during wartime, has passed carefully crafted legislation that grants powers to the President but reserves Congressional oversight over important aspects of those powers. The legislature, for example, authorized the use of military commissions instead of civilian courts, but did so in a way that ensured that Congress retained some control over those commissions. The President thus got what he wanted, but not everything he wanted; Congress was showing that it would indeed push back. By 2004, the Supreme Court was ready to declare (in Hamdi v. Rumsfeld) that “a state of war is not a blank check for the President when it comes to the rights of the Nation’s citizens.” (The reader is invited to imagine such a declaration from the Supreme Courts of 1862 or 1942.) And yet, Goldsmith is untroubled by this tension between the branches of government; instead, he sees these developments as evidence that “the Constitution is working well,” even as it forever changes the powers of the President during wartime. Near the conclusion of his remarks, Goldsmith returned to the words of Schlesinger: “The test of whether checks and balances are working well is the vital mechanism of self-correction.” In hindsight, with a hot war on American soil, it’s understandable that Lincoln would resort to extraordinary measures to preserve the Union and protect its citizens from a threat that was all too immediate. Even in 1942, there was a widespread perception that the government had to do whatever it could to ensure the safety of American citizens in a worldwide conflagration. But in enabling modern legal institutions to correct overextensions of presidential power, Goldsmith sees the Constitution as doing what it was intended to do: secure the blessings of liberty even as it provides for the common defense. L. Steven Emmert is an appellate attorney with Sykes, Bourdon, Ahern & Levy, P.C. in Virginia Beach, Virginia. 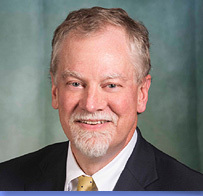 He is the founder and immediate past chairman of the Virginia Bar Association’s Appellate Practice Section, and is the immediate past chairman of the Virginia State Bar’s Appellate Practice Committee. Steve analyzes Virginia appellate decisions and trends at the website Virginia Appellate News & Analysis.